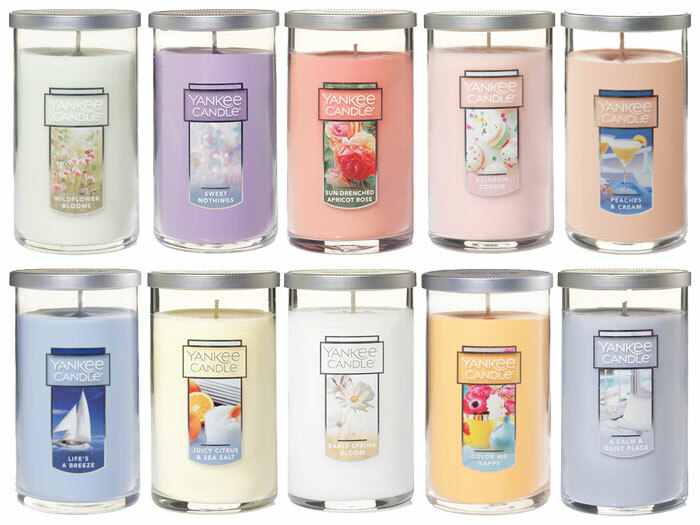 New Spring Fragrances by Yankee Candle - A collection of fresh home fragrance inspired by the season of renewal. Ten new spring scents include A Calm & Quiet Place (jasmine, patchouli, amber), Color Me Happy (mango, peach, vanilla), Early Spring Bloom (poppy, cherry blossom), Juicy Citrus & Sea Salt (orange, grapefruit, sea salt), Life's A Breeze (sea air, oakmoss), Peaches & Cream (sweet cream, peach), Rainbow Cookie (vanilla frosting, citrus, peach), Sun-Drenched Apricot Rose (apricot roses, orange apricot), Sweet Nothings (lotus, powdery musk), Wildflower Blooms (daisy, peony, magnolia). Available now in classic jar candles, tumbler candles, tea light candles, tarts wax melts, easy meltcups, and votive candles. A centered fragrance - balanced with gentle jasmine, a whisper of patchouli, and warm amber musk. A scent as fresh as a hillside of just-opened poppies. Cookies so light and airy they're ready to melt in your mouth - filled with citrus and peach and sweet vanilla frosting. Warm, soft, sweet - like a special whisper just for you.